Come to Belfast on Saturday 17th November as the city gets festive and marks the official start of Christmas! 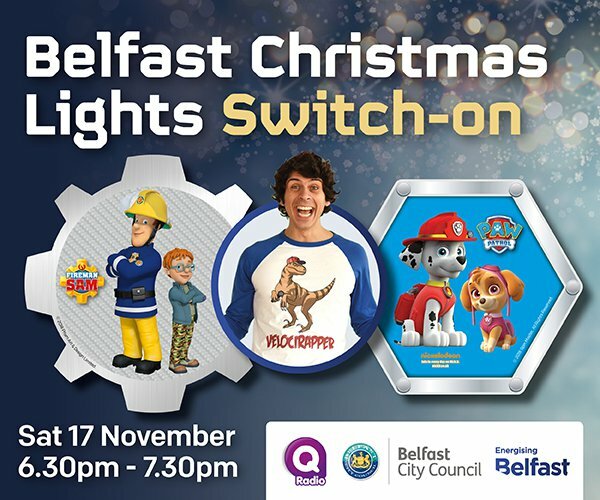 Join the Lord Mayor and her special guests, Paw Patrol’s Skye and Marshall, Fireman Sam and Norman Price, and TV presenter Andy Day, as they turn on the lights for Christmas! Q Radio breakfast presenters Stephen and Cate will host the evening and lots of musical fun awaits with mini shows and traditional carols before the big switch-on. The event will take place on Saturday 17 November, from 6.30pm to 7.30pm (approx.) in front of City Hall - a fantastic way for families to countdown to Christmas! Gates will open on the evening at 6pm with live entertainment on stage from this time. All tickets for the Christmas lights switch-on event have now been allocated. If you have received your ticket, please ensure you have read the terms and conditions..
Don’t forget to post your child’s Christmas wishes to the North Pole via our postbox beside Santa's grotto in the Belfast Christmas Market. Each child who posts their letter with a return address before Monday 17 December 2018 will receive a response from Santa himself. Come to Belfast city centre early on Saturday 17 November and explore the city. There'll be entertainment around the city centre to enjoy. Please note that there will be traffic restrictions and diversions in place within Belfast city centre from mid-afternoon on Saturday, 17 November, due to the Christmas lights switch-on, so please allow time for your journey.